SSA-250 is a multi application high Power PA Amplifier capable of delivering 250 Watts, ideally suited for a wide variety of music and public address applications. This amplifier is designed to give high power, clean sound and reliable, trouble free operation under extreme climatic & weather conditions. Features include 6 Mic inputs, 2 Aux inputs, cut / boost type bass & treble controls, resettable circuit protector, and provision for connecting 24V battery. 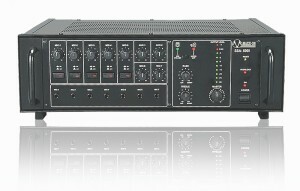 Facility is given for mixing MP3 playback signal with both Aux and most Mic inputs. 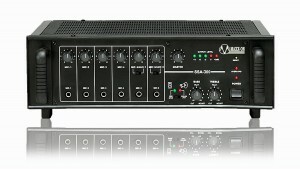 Line Input for connecting the output from any external mixer or permitting SSA-250 to be used as a Booster Power Amplifier. SSA-300 is a multi application high Power PA Amplifier capable of delivering 300 Watts, ideally suited for a wide variety of music and public address applications. This amplifier is designed to give high power, clean sound and reliable, trouble free operation under extreme climatic & weather conditions. Features include 6 Mic inputs, 2 Aux inputs, cut / boost type bass & treble controls, resettable circuit protector, and provision for connecting 24V battery. 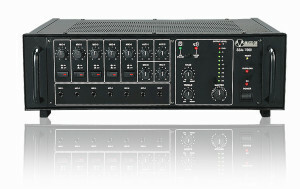 Facility is given for mixing MP3 playback signal with both Aux and most Mic inputs. 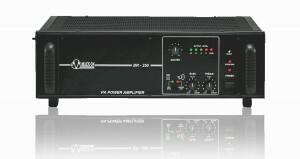 Line Input for connecting the output from any external mixer or permitting SSA-300 to be used as a Booster Power Amplifier. SSA-10000 is a multi application high Power PA Amplifier capable of delivering 1000 Watts, ideal for driving high power sub-woofers as well as large PA Installations involving large number of speakers. This amplifier is designed to give high power, clean sound and reliable, trouble free operation under extreme climatic & weather conditions. Features include 8 microphone and 4 aux inputs (one of which is through RCA jacks and specially meant for CD/DVD Players). In addition resettable circuit protector, ±10dB Cut/Boost Bass/Treble controls and AC/48V battery operation are provided. AUX-4 input is through RCA Socket, specially for connecting CD/DVD Player. Line Input & Output provided for connecting to a Mixer and Booster Amplifier respectively. Preamplifier output for recording. Box Speaker/Driver Unit selector switch. Bass boost can be defeated at Driver Unit position for safer operation of driver units. 10 LED Bar Graph Signal Level Display. SSA-7000 is a multi application high Power PA Amplifier capable of delivering 700 Watts, ideal for driving high power sub-woofers as well as large PA Installations involving large number of speakers. This amplifier is designed to give high power, clean sound and reliable, trouble free operation under extreme climatic & weather conditions. Features include 7 microphone and 3 aux inputs (one of which is through RCA jacks and specially meant for CD/DVD Players). In addition resettable circuit protector, ±10dB Cut/Boost Bass/Treble controls and AC/36V battery operation are provided. 7 Mic & 3 Aux Inputs. AUX-3 input is through RCA Socket for connecting CD/DVD Player. 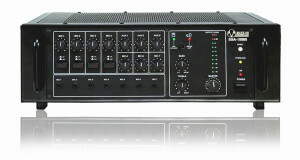 Line Input for connecting the output from any external mixer or permitting SSA-7000 to be used as a Booster Power Amplifier. SSA-5000 is a multi application high Power PA Amplifier capable of delivering 500 Watts, ideal for driving high power sub-woofers as well as large PA Installations involving large number of speakers. This amplifier is designed to give high power, clean sound and reliable, trouble free operation under extreme climatic & weather conditions. Features include 7 microphone and 2 aux. In addition resettable circuit protector, ±10dB Cut/Boost Bass/Treble controls and AC/36V battery operation are provided. SSA-350 is a multi application high Power PA Amplifier capable of delivering 350 Watts, ideal for driving high power sub-woofers as well as large PA Installations involving large number of speakers. This amplifier is designed to give high power, clean sound and reliable, trouble free operation under extreme climatic & weather conditions. Features include 7 microphone and 2 aux. In addition resettable circuit protector, ±10dB Cut/Boost Bass/Treble controls and AC/36V battery operation are provided. 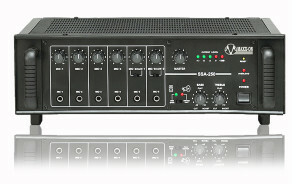 Line Input for connecting the output from any external mixer or permitting SSA-350 to be used as a Booster Power Amplifier. SPA-5000 is a multi application Super Power Booster PA Amplifier with rated output 500 Watts, ideal for driving high power speakers as well as large PA Installations involving large number of speakers. This amplifier is designed to give high power, clean sound and reliable, trouble free operation under extreme climatic & weather conditions. Features include balanced input 200mV/1V switchable through slide switch. In addition resettable circuit protector, Cut/Boost Bass/Treble controls and AC/36V battery operation are provided. Ideal for large installations where a high power output is required. 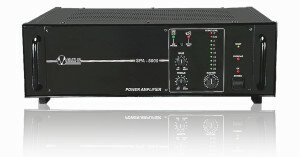 A combination of a SSA-5000 and one SPA-5000 can deliver 1000W power output. BR-250 is a multi application high Power Booster PA Amplifier capable of delivering 250 Watts, ideally suited for a wide variety of music and public address applications. This amplifier is designed to give high power, clean sound and reliable, trouble free operation under extreme climatic & weather conditions. Features include balanced input 200mV/1V switchable through slide switch. In addition resettable circuit protector, Cut/Boost Bass/Treble controls and AC/24V battery operation are provided. 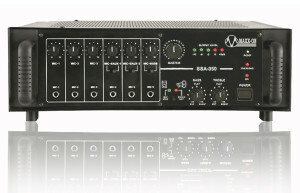 By connecting four booster amplifiers BR-250 to one SSA-250, the user can have a 1250W mono system.